Punch time records in the Attendance module of Bizimply can be removed. These could be the punch times synchronised from the Timestation App or manually entered in the the Review Punch Times section of Bizimply. Removed records will remain visible, however, they will no longer affect or be seen in the employee timecards. You can remove a punch record in the Review Punch Times section of the account which can be found in the Attendance module. Here you will be able to see all the raw records from the Timestation App or those that were manually entered. 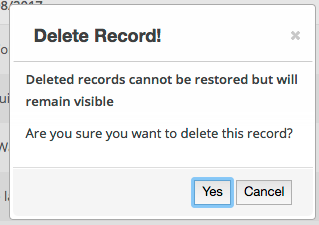 You will see an option to remove these times to the right of the associated record. Once you have selected this option you will be asked to confirm your action. Note that these cannot be reinstated after confirmation. Once deleted you will still be able to see a historic record of it but it will be crossed out and not have any affect on other aspects of the system. This can be a great way of keeping your clock-in records clean. You'll be able to remove any duplicates or unnecessary records that may have occurred due to being manually created, testing the system or any other means.